Here are some former postal sites I've visited of late. Two I had the pleasure of visiting yesterday afternoon in conjunction with a visit to Valley Forge, northwest of Philadelphia. First up is a post office that was discontinued at some point within the last ten years, a branch of Phoenixville, PA: Mont Clare. Thanks to the OIC of nearby Oaks for telling me where this former site is. Now just a residence, the former postal site is apparent by the handicapped ramp. Fortunately the Phoenixville post office, a stately 1923 facility, isn't far away at all. I just knew there had to be a grand former post office in Pottstown, PA somewhere. The 1915 behemoth I found on the south side of Main Street, which is now a library, did not disappoint. The cornerstone, bearing "Secretary of the Treasury" on it, was sufficient evidence to prove this was once a P.O. 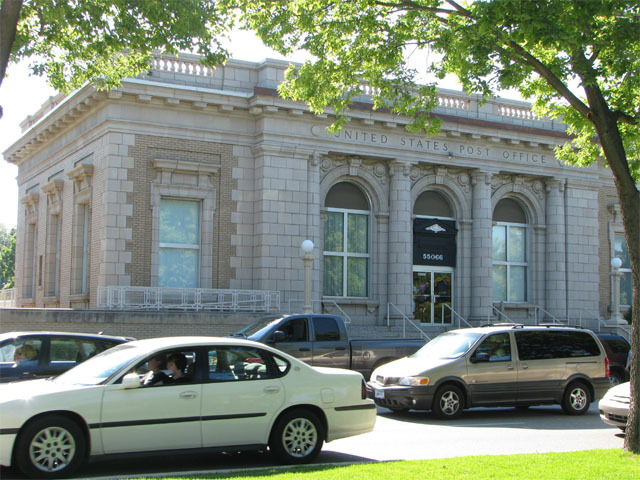 Gotta love when former post offices are still used for civic purposes! The present Pottstown facility, which is just down the road, is rather bland in comparison. I discovered that the site, as currently stands, is less than overwhelming. 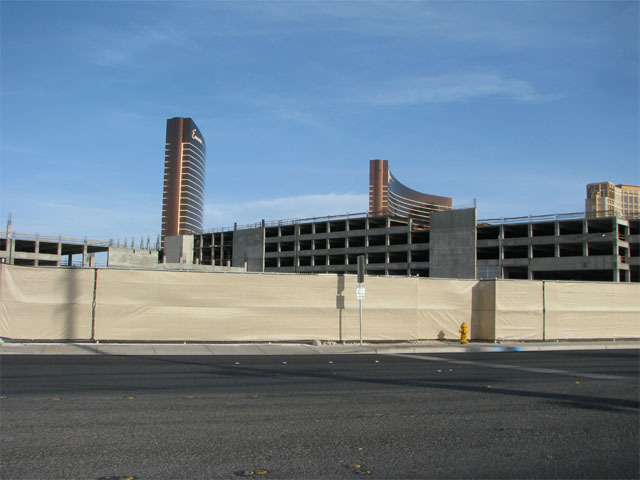 Heck, it appears to be a construction zone for a new casino parking garage or something. Believe it or not this town of 16,500 was once the wheat-growing capital of America. Located an hour southeast of Minneapolis, the Goodhue County seat, along the Mississippi River, relinquished its prominent port regional status to the Twin Cities with the advent of regional railroads in the late 1800s. It's a gorgeous town with a great post office, several parks, and nice views from the peak of its local Barn Bluff. Back in 2008 I was told by my friend Katie in St. Paul that the town made a nice day trip from the Twin Cities, and I'm glad I went. The quickest way to Red Wing is actually through Wisconsin, and I enjoyed a shoreline drive along SR 35 after a stop in the town of Prescott. It had a great main street and even beachgoers at Point Douglas across the Minnesota border. It seemed pleasant. Indeed, along Main Street a woman told me that once you move to Prescott, you never want to leave. A few hundred feet south of the automotive bridge lies a train trestle that made for a couple of great photographs. The towers resemble either Transformers-in-waiting or two bench-pressing muscle men. Below is a Google Street View inset that you can shift around and toy with if you so choose. Of course, here's a photo of the PO. It matches the collection boxes! So, let's have a closer look at Red Wing. The post office, a strikingly gorgeous building that dates from 1909, is located across a major road from a park. The two clerks inside were friendly and I got a solid round date for my collection. The building appeared to have been maintained well. After lunch I headed to Barn Bluff and took the mild hike up what was at times a rather steep cross-slope. A full description and views of the bluff can be found here. Here's a view down the north slope. While exploring the post offices of the Las Vegas metropolitan area, I set out to document a few desert POs in southern Nevada and along the edge of California. 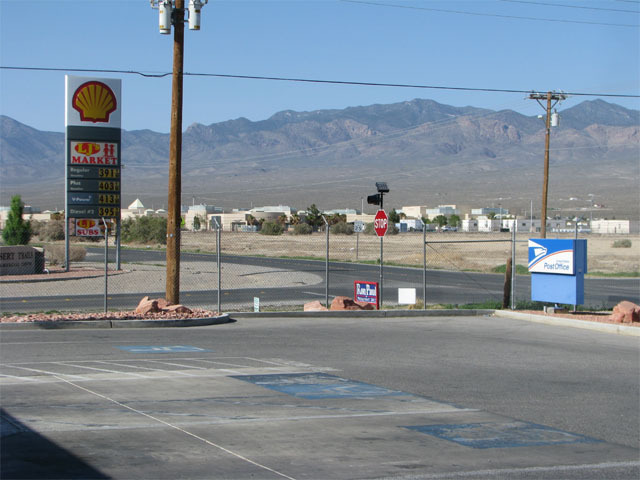 Look no further than Pahrump, NV as evidence that postal adventures can be realized in nearly any setting, no matter how mundane. So what can one say about this locale in the southern tip of Nye County? ... It has legalized prostitution but no ordinances governing zoning or land use. Play around with this movable satellite view and see if you can figure out what in the sun's blazes is going on. Pahrump now occupies 364 square miles, housing 36,400 residents. Cheyenne, Wyoming has a population density 24 times that of Pahrump. Consider that the town possessed only 7,400 residents just 20 years ago. 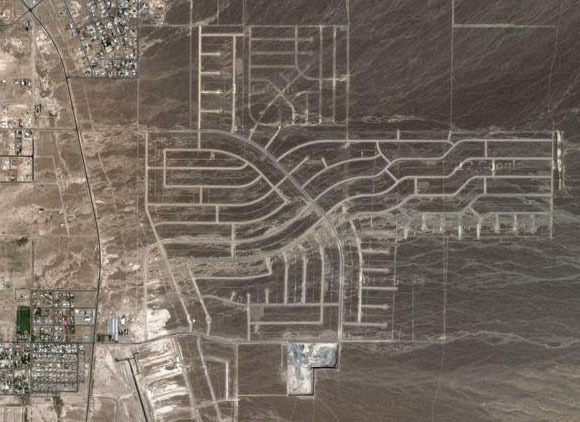 Now, Pahrump is a massive sprawling grid in the middle of the desert, half of which was built out to accommodate development that has never come to fruition. The vastness of the town and the possibility of future population infill is what enables three post offices to operate. Here's a satellite image of a massive sub-development that wasn't. The roads are all laid out, yet there's nothing there. It's right by a private airport just east of the town's main thoroughfare. So, let's get a geographic fix on the postal landscape! 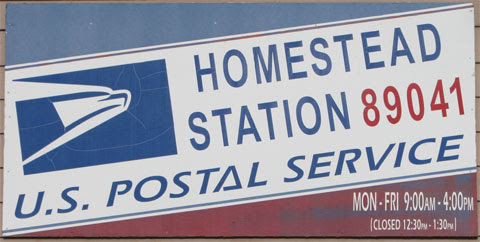 Pahrump possesses a main post office and two stations: one north -- Simkins, and one south -- Homestead. I've not been able to find history on the past of the Pahrump post office, though one website shows a cover cancelled there in 1937. Simkins and Homestead were established relatively recently: Simkins in 2001, and Homestead in 1994. Simkins Station is across the street from a Shell station to the north, a house to the east, and is kitty corner from a large vacant block. Beyond its bland setting, the office is surrounded by barbed wire fencing. Considering that the lobby and parking lot are always open, that seems like bit of a moot defense mechanism. The location houses 580 PO Boxes and is staffed by one clerk from 9:00am-12:30pm and 1:30pm-4:00pm Monday through Friday. 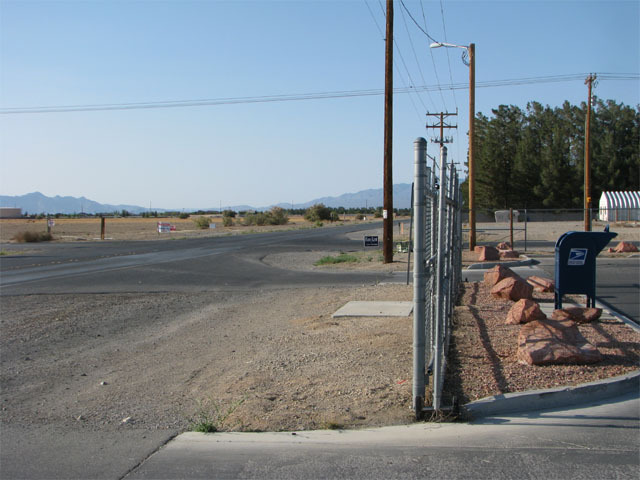 The Pahrump Valley Times reported that Simkins Station was targeted for closure last summer, but the office was never a part of the 3,650-office RAOI discontinuance studies. Pahrump's Main Post Office, in current iteration, has been housed at 2300 Postal Drive since 1995. The lobby is open 24/7 and possesses an APC. 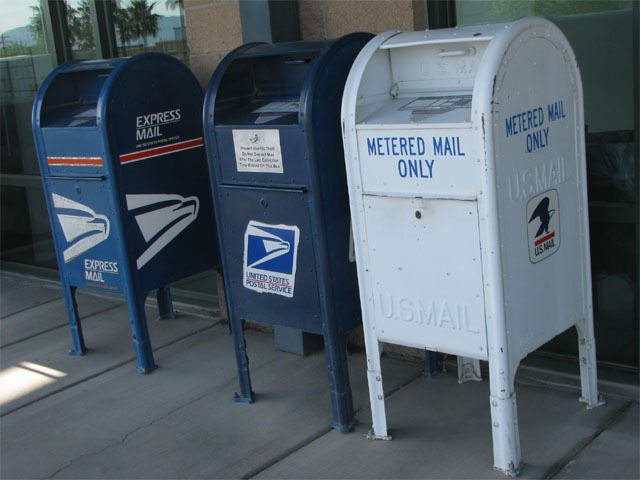 The front of the offices has, in addition to a regular blue collection box, an Express Mail box, and a FedEx bin, a white collection box for metered mail only. That is something I had never seen before... obviously I had to grab a photo of it. Pahrump's Homestead Station is in a setting similar to Simkins's. It's in a neighborhood that is half residential yet half devoid of development, on a drag punctuated by an occasional little shop. In fact, the site that presently houses the post office formerly housed a brothel! But the building is new and nice; the siding blends with the palate of the landscape. The highlight of the building is the signage, which is unique to the location and hand-stenciled. It even features the hours of operation! Wouldn't want to have to change those. Regardless, this is what classifies this entry as a Nice Touch. Hope you enjoyed your postal tour of an interesting little corner of the world! South of I-80 in west-central Pennsylvania lies yet a small-town post office that had been threatened by closure as part of RAOI -- perhaps until this afternoon. I had the pleasure of exploring the Redbank Valley and heading down to the tiny town of Oak Ridge a few months back. The town is home to approximately 200 people. There were several aspects of this office that made it unique. Let's have a look around! You'll note one of the wonderful things about the state of Pennsylvania: so many of its small towns have signs leading you to its post office. And can you blame them? As I've said on multiple occasions: The rural post office is the difference between a bunch of houses and a community. Let's head to the office itself. The first thing you might notice upon arrival is the cushy chair. There's actually a mini-cozy couch outside the office for its patrons to sit down -- or perhaps wait for the rain to let up, under a porch roof. I've seen benches and chairs, but never anything quite like that. Earlier that weekend I saw a faded hand-painted sign noting Mail Pouch Tobacco. And wouldn't you know it, outside here was a Mail Pouch Tobacco! 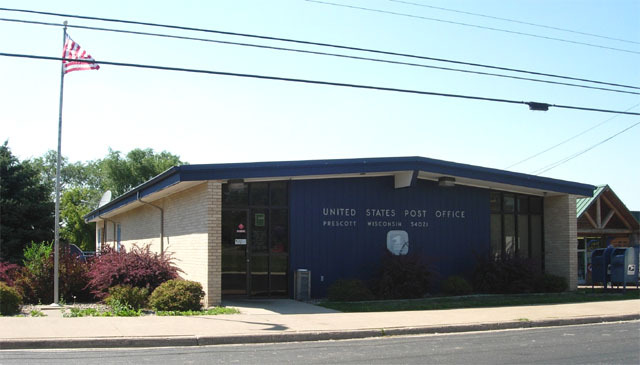 But alas, it seems as though the Oak Ridge post office will be able to serve the community for at least a little while longer, although the proposal is to reduce its service to two hours daily.